The Australian dollar is extending its losses it has made earlier this week following a release of the Statement on Monetary Policy from the Reserve Bank of Australia. Note that the Antipodean currencies has lost as much as 2.3% so far this week being battered by a change in rhetoric expressed by RBA’s Governor Philip Lowe who suggested that a rate cut could be on the table if some conditions were met. Anyway, today’s underperformance of the Aussie stemmed from the significant downward revisions of economic and price growth. We show the summary of RBA’s predictions below. As one may notice GDP growth for 2019, on average, is currently seen at 2.75%, down from 3.25% in its earlier statement. The same scenario was applied in case of 2020. It needs to be noted that the central bank signals that the first half of 2019 could be much worse than the second one predicting GDP growth to slow to 2.25%, down from 3.25% previously. 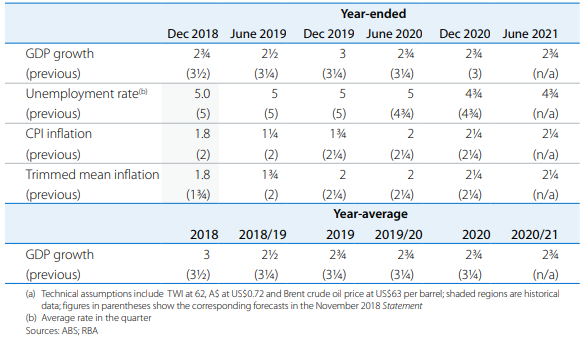 These refreshed forecasts seem to fit the overall tone seen elsewhere with many central banks revising their expectations down. As far as inflation is concerned the RBA cut its estimations across the entire horizon except the prediction concerning the end of 2020. This implies that the central bank will be unable to strike its mid-point of the inflation objective of 2.5%. Hence, one may expect that it could be also stripped of a possibility to tighten monetary policy in this cycle at all. After today’s release the interest rate market assigns as much as 60% odds for a rate cut scenario by the year-end, up from roughly 30% at the beginning of this week. To sum up, it has been a rough week for the Australian currency but the overall outcome does not seem to be upbeat. Although we see the Aussie neither over- nor undervalued, it could be come under prolonged downward pressure in the nearest future. Looking forward, it could be driven more by the incoming data from the US and the impact the data might have on the US dollar.